We were curious to have a look at the current state of Sangiovese in California, so we assembled a range of wines from different regions and included a famous wine from Washington state as well. 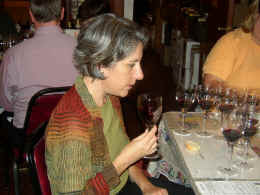 Sangiovese has generated some interest amongst California vintners, more so, perhaps, than it has for consumers. The character of Sangiovese is that it tends to be lighter in body than Cabernet, Merlot and Zinfandel. In this day when many consumers look for inky, black wines which are impressive for size and power, it's no wonder the relatively mild-mannered Sangiovese has not found a wider audience. Our tasting found a set of, surprisingly, good wines. One critic, though, may have gotten it right when looking at the roster of wines, saying "I must have mis-poured the Sangioveses, because I didn't taste any $60 wine in this tasting." I felt we had good wines, though. Whether of not the wines warrant the price tags is another question. One wine pretty much out-distanced the field. hot wine in the mouth." (Editor's note: ethyl acetate is an ester, a volatile compound of ethanol and acetic acid that inevitably develops into acetic acid in the bottle. Other alcohols and acids can bind to form esters). Bob also found "a sharp estery note but not necessarily ethyl acetate. There were also prune-plums (perhaps a bit of Syrah in there?) very ripe fruit with Sangiovese character coming up finally. There were prune plums on the palate, too. The (over) ripeness pushes the Sangiovese fruit beyond any possibility of subtlety or complexity. Gerald found an "odd cellar note to this wine...is it corked or tainted, perhaps? That fragrance seemed to dissipate. 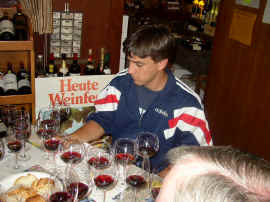 The wine is rather charry on the palate with a 'burnt' note as its central theme. Not unpleasant, though. One star on my three star scale, no stars being a standard or ordinary wine." "Tart berries and rhubarb" remarked one taster, "with cherries and some heat on the finish." Another found "vanilla from the oak; a drinkable red with a bit of stuffing." Another found a "stinky wine with a hot finish and not a trace of Sangiovese fruit." 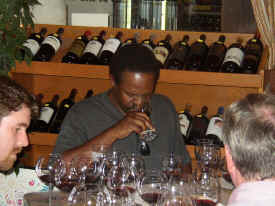 Bob liked it, "not so much as an interpretation of Sangiovese but as an old-fashioned California red wine. Some Sangiovese character did come up eventually showing dried cherries, orange peel and wood from large tanks rather than small barrels." His palate cried out "where's my spaghetti! Here's an old Sonoma take on Sangiovese. Nice in its way." He also noted the "heat on the finish." Gerald found this to be a "Chianti-styled red with a mildly cherryish fruit character and a touch of vanilla from the oak. The elements show nicely on the palate, too. Very pleasant wine. One-and-a-half stars." nose and black fruits, chocolate on the palate with dusty plums on the finish." Another was less impressed. "Clumsy, over weight and under achieving; ripe to the point of syrupy." The wine as it turned out had an alcohol level of 15.8%(!). Bob's note quoted "dusty, earthy tones" (above). He also found some "wet leather (from Brettanomyces) and a nice bit of Sangiovese fruit in there, dried cherries especially. Ripe black fruit & fruit skins showed on the palate, the Brettanomyces is less pronounced there but the fruit wants concentration, balance; a wine with a rustic edge." Gerald detected a sweet cherry aroma and a hint of a floral quality on the nose. "The wine features some ripe cherry fruit and a bit of heat on the palate with a medium level of tannin. One half star, perhaps." blackberry, tobacco, spice and oak." Another found it "the least of the set to show Sangiovese character." 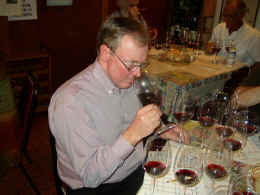 Bob found "curious but correct Sangiovese aroma: meaty, sweet spice (from oak and fruit) with traces of tin can & ammonia. Cherry fruit came up finally. But it performed even less well on the palate with raspy tannins, over-ripe fruit (like an over-the-hill peach!) and only moderate concentration. Nice try boys!" As with other recent releases from Foppiano, this wine has a lovely, woodsy fragrance. "I don't understand why some tasters react negatively to this element in the wine." said Gerald. He found lots of "sweet, cedar fragrances and a coffee aroma, too. Certainly an internationally-styled red wine...very showy. Two stars!" stinky, flat, tannic and muddled." Bob's take was completely different. He did get a bit of "rubber tire at first but it gives way to generous Sangiovese fruit with a sweet berry leaf herbaceous edge and dried fruits (citron, orange peel); terrific nose! On the palate very Tuscan in style; drying tannins, nice length; a serious Sangiovese interpretation." N.B. 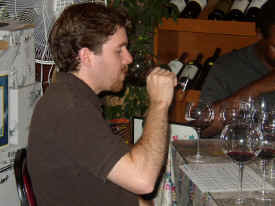 Post tasting, Bob and another long time taster agreed that "this was easily the best Atlas Peak Sangiovese to date." The property is owned and managed by the famed Tuscan house of Antinori. Gerald said "This is the best Atlas Peak Sangiovese I've ever tasted! There's an odd note reminiscent of eucalyptus or a resiny quality on the nose, but also a nice cherry character. The wine is not particularly profound or deep, but it does offer a good Sangiovese flavor without pretensions to being something like a Cabernet-fortified Super Tuscan. Served in place of a good Chianti, this would certainly be a satisfying wine. One-and-a-half stars." 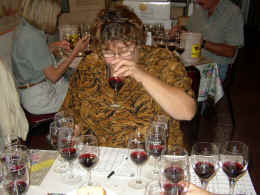 One taster found "typical Sangiovese character" and another said "nice wine but could use more fruit." Someone else found "bright cherries, not a powerhouse but nice." For another there were "floral notes on the nose and berries and anise on the palate." Another was much taken: "gorgeous, velvety, Yum!" For Bob "wood and alcohol dominate giving the wine a curious spirity note (perhaps Armagnac?). Some Sangiovese fruit and spice and a metallic edge come up. I get Calvados on the palate. The fruit is totally unfocused, lost between the oak and alcohol." Gerald described this as being reminiscent of a "baby Brunello. The wine features some ripe, warm Sangiovese fruit with a touch of a woodsy quality. The tannin level is probably too high given the fruit on the palate, but it is still a good wine. It leans towards being a tad rustic, but I still give it a one star rating." "Huge, intense and yet well balanced!" exclaimed one taster. palate saw "minerals, white cranberries, toasty oak and herbs." Gerald found this to be "Mildly brambly with a rather ripe note to the fruit. There's a woodsy note on the nose and some spice and pepper. On the palate it's a bit strong and the alcohol shows some heat. Still, a very nice wine. Ridiculously priced, though. One star." grapefruit," "saddle leather" and "goat cheese" (pejorative). Bob found a "dusty, chalky edge and full bore Sangiovese fruit and lots of sweet oak. Is there some Merlot going on in there? On the palate there's structure, cherries but here the Sangiovese seems to get lost amid all that oak." Gerald encountered "ripe, almost stewed cherry fruit with a light oak note on the nose. The wine has good Sangiovese fruit on the palate and a nice bit of vanilla from the oak. One-and-a-half stars."